Cambinata Yabbies is a family owned and operated company, located in Kukerin, Western Australia, three hundred kilometres south-east of Perth. Our popular new Cambinata Gourmet range, which includes bottled yabbies and abalone in a variety of flavours, provides consumers with a unique taste experience. Yabbies have been enjoyed by indigenous Australians for many centuries, but only now is the world waking up to their secret delights. These unique, freshwater crustaceans are delicious and versatile, making them ideal for the creative chef who is looking for that special “something” to complete the menu. Their delicate, sweet flavour and firm texture has won lavish praise from connoisseurs the world over. Yabbies are like mini-lobster, and turn orange on cooking. Most of the flesh is in the tail, but the claws offer an added bonus, with their own unique, delicious flavour. Cambinata Yabbies are sure to delight the most discerning diner. 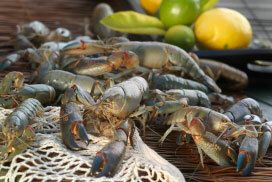 You can find further information about yabbies here. Cambinata supplies Australian and export markets (in Asia, Europe and the US), and 70 per cent of their production is exported, either live or frozen. Cambinata Yabbies also offers a unique location for your events and functions. Details of the 2013 Extravaganza, including a printable flyer, may be found here. It is twenty years since Cambinata Yabbies was first established. We are throwing a party on 18 March for all our suppliers, customers and friends. If you would like to join the fun, please contact us for more details. Cambinata's annual Extravaganza was featured as #7 of the Top 100 Diary Dates for 2010 in the Jul-Dec edition of Scoop Traveller. More about the Extravaganza can be found here. The Extravaganza was featured on Channel Nine's Postcards WA.